Why Do I Need PMI and What is it? You might have heard of the term PMI and wondered what it is when talking about a mortgage. If your lender is throwing around the term PMI or private mortgage insurance, it usually means that you have a down payment of less than 20% on a new home loan. Private mortgage insurance protects the lender from losing money if the borrower ends up in foreclosure. Think of it this way, if you buy a house that's $400,000 and you put 20% down, that's an $80,000 leeway and also instant equity immediately after you purchase the property. You only owe $320,000 on a $400,000 property. If you need to sell the property, you can afford the commission and closing costs because you have that additional cushion of $80,000. Now, if you only put down 3% on a $400,000 home that's only $12,000. If you foreclose or default on the loan, the lender only has a $12,000 cushion to pay closing costs and any real estate commissions, which is typically not enough. Because of this, lenders will institute private mortgage insurance, which adds to your monthly mortgage payment in case you default. Private mortgage insurance fees vary from around .3% to 1 1/2% of the original loan amount per year. This is also dependent on the size of your down payment and your credit score. Mortgage insurance paid in 2017 is tax-deductible but we don't know what will happen for 2018 as the Trump administration is currently overhauling the tax code. So let's say you're looking at a $200,000 house with a 10% down payment. This means that you'll put $20,000 down and borrow $180,000. With a high credit score, you're likely to get a lower PMI rate, possibly .3% per year. This means your annual premium will be about $540 or $45 a month additional on top of your principal payment, taxes, and homeowners insurance. The only way to eliminate PMI is when your outstanding loan balance drops to 78% of the homes original value and this could take several years. Of course, you can speed that up by making more payments, higher payments, or until your homes value increases. But, you have to request the cancellation of mortgage insurance when the loan to value drops to 80% or lower. FHA also has different regulations and a lot of their loans have insurance premiums that cannot be canceled. In this case you will have to refinance the loan, typically with a larger down payment and possibly a conventional loan with no PMI. 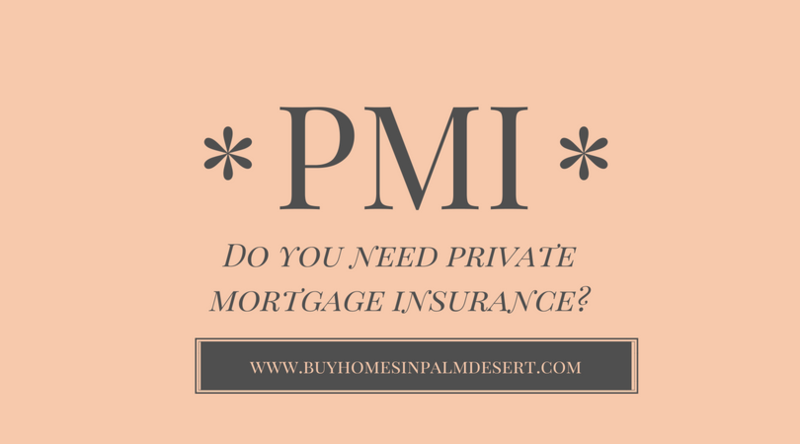 For more questions on PMI, mortgage insurance, or applying for a home loan throughout the Palm Desert area give us a call.